One of Auror’s strongest customer relationships is with Briscoe Group, operator of the popular Rebel Sport, Briscoes Homewares, and Living & Giving stores across New Zealand. For the past three years we’ve been working across the company to help reduce crime at stores through a more effective intelligence and prevention strategy, which is why we’re excited to share with you the results of that partnership in our latest case study. With a recognised name and national footprint of more than 85 stores, Briscoe Group is always looking to protect its brand and profits with a proactive approach to stopping crime. 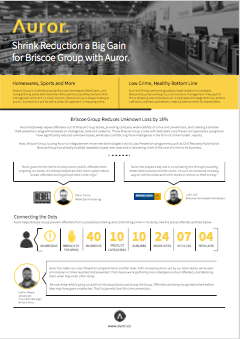 Since joining the Auror community, Briscoe Group stores with Loss Prevention Specialists using the platform have successfully dropped unknown losses by 18%. Group Loss Prevention Manager Nathan Breed is charged with protecting store staff, customers and the overall brand with a mix of loss prevention specialists and strategies, and now, Auror. “Auror has taken our Loss Prevention programme to another level. With increasing Auror use by our store teams we’ve seen an increase in crimes reported and prevented. That means we’re gathering way more intelligence about offenders, and deterring them when they enter other stores. “We now know what’s going on, both at individual stores and across the Group. Offenders are being recognized where before they may have gone undetected. That’s a powerful tool for crime prevention,” says Nathan. Find out how Nathan and his team are winning the fight against crime in our new case study.